Texas is producing so much oil that it will soon be bumping up against pipeline capacity. Some producers are already selling at a discount because of the limitations. Another problem is a shortage of labor, though that will likely be good news for the state and for people moving to Texas to find work. U.S. crude oil production last week hit 11 million barrels per day (bpd) for the first time in the nation’s history, the Energy Department said on Wednesday, as the ongoing boom in shale production continues to drive output. The gains represent a rapid increase in output, as the data, if confirmed by monthly figures, puts the United States as the second largest producer of crude oil, just behind Russia, which was producing 11.2 million bpd in early July, according to sources. “Eleven million would have made us the biggest producer in the world; but actually Russian production in June was above 11 million. So, this is kind of like the space race,” said Sandy Fielden, director of research in commodities and energy at Morningstar. EIA forecasts total U.S. crude oil production to average 10.8 million b/d in 2018, up 1.4 million b/d from 2017. In 2019, crude oil production is forecast to average 11.8 million b/d. If realized, the forecast for both years would surpass the previous record of 9.6 million b/d set in 1970. Crude oil production at these forecast levels would probably make the United States the world’s leading crude oil producer in both years. Of course, gasoline prices are still up a bit thanks to problems in Venezuela and sanctions on Iran. But fracking has made the U.S. the world’s energy powerhouse and that should continue well into the 2020s. This is data the Trump administration should continue to cite as a sign America is resurgent. The United Nations Human Rights Council’s controversial Agenda Item 7 is designed to undermine Israel’s existence, United States Ambassador Niki Haley told The Heritage Foundation in Washington late Wednesday afternoon. She spoke about her country’s withdrawal from the council after it failed to sway the 47-member body to undergo serious reform measures to prevent human rights abusers from hijacking its agenda. The UNHRC’s continued biased treatment of Israel is symptomatic of the problem, said Haley as she pledged that the US would continue to work from the outside to from the human rights body. Prior to leaving the council, the US had unsuccessfully tried to eliminate Agenda Item 7, which mandates that the UNHRC must debate alleged Israeli human rights abuses at each season. “No other country – not Iran, not Syria, not North Korea – has an agenda item devoted solely to it. Agenda Item Seven is not directed at anything Israel does. It is directed at the very existence of Israel. Prior to leaving the council the US met with more than 125 member states about reform measures, Haley said. “In the end, the United States couldn’t convince enough countries to stand up and declare that the Human Rights Council was no longer worthy of its name,” Haley said. The “most obvious reason is that authoritarian regimes are happy with the status quo,” Haley said. They seek council seats to protect their human rights efforts and those of their allies from scrutiny, she said. Countries such as Russia, China, Cuba and Egypt “benefit from making a mockery of the Human Rights Council. So it’s no surprise that they openly resisted our efforts to reform it,” Haley said. What was surprising was the pro-human rights countries and non-governmental groups that also refused to work with the US to reform the UNHRC, even as they acknowledged its flaws. Haley said. Those NGOs “came out publicly against our reforms telling other countries to vote against us. Groups like Amnesty International and Human Rights Watch sided with Russia and China on a critical human rights issue,” Haley said. They were afraid that countries who are known human rights abusers would push for retaliatory “hostile amendments” in the UN General Assembly, Haley said. She charged that these NGOs also feared losing “institutional comforts” at the UN. “They have big staffs and lots of relationships with the UN bureaucracy. Change is threatening to them,” Haley said. “But after months of agreeing with us on all of the flaws of the Human Rights Council, they would not take a stand unless it was behind closed doors, and out of public view,” Haley said. The US remains committed to fighting on behalf of human rights both globally and inside the UN, Haley said. “We just won’t do it inside a Council that consistently fails the cause of human rights,” Haley said. “Our withdrawal from the Human Rights Council does not mean that we give up our fight for reform. On the contrary, any country willing to work with us to reshape the Council need only ask,” Haley said. “Fixing the institutional flaws of the Human Rights Council was, is, and will remain one of the biggest priorities at the UN,” Haley said. She was particularly moved, she said, by the mothers and children she met in refugees camps in Ethiopia, Congo, Turkey and Jordan. “As long as we have a voice, we must use it to advocate for these mothers and children. I will use my voice. Not just because I am a mother. Not just because I am an ambassador. But because I am an American. And America can no more abandon the cause of human rights than abandon itself,” Haley said. Today we’re talking about Benjamin Netanyahu, Israel’s Prime Minister and the most powerful politician the country has had in the last 2 decades. Why are we talking about Netanyahu? Why is he so important? Let’s see it! Syrian rebel resistance to the Syrian Army advance on Quneitra opposite the Israeli Golan crumbled on Thursday, July 19, in the absence of Israeli military support. The terms of surrender that rebel leaders signed with Syrian army officers obliged them to hand over all their strongholds, including the town of Quneitra. The Syrian army was able to return to the positions held before the 2011 uprising without a shot. Rebels refusing to sign were to be sent with their families north to Idlib province. Israeli officials and military leaders were dismayed by a message received from Damascus claiming that the 1974 Separation of Forces Accord, which both governments resuscitated this week, allowed Syrian aircraft, including assault helicopters and UAVs, to fly over the buffer zones of the Golan up to the Israel border. Damascus relayed a copy of the accord to Moscow with a warning that any Israeli attempt to shoot down a Syrian overflight would be a breach of the 1974 accord, and its endorsement on July 16 at Helsinki by Presidents Donald Trump and Vladimir Putin. DEBKAfile revealed on July 17 that Prime Minister Binyamin Netanyahu had partnered the Helsinki deal for the restoration of southern Syria to the Syrian army under Russian oversight. Israeli officers were handed the Syrian message on Thursday by the UNDOF commander, Maj Gen. Francis Vib-Sanziri of Ghana, who is henceforth responsible for monitoring implementation of the Helsinki deal. According to DEBKAfile’s military sources, this Syrian message for the first time forbids the Israeli air force and anti-air missile batteries shooting down Syrian aerial vehicles entering the air space over the buffer zones. 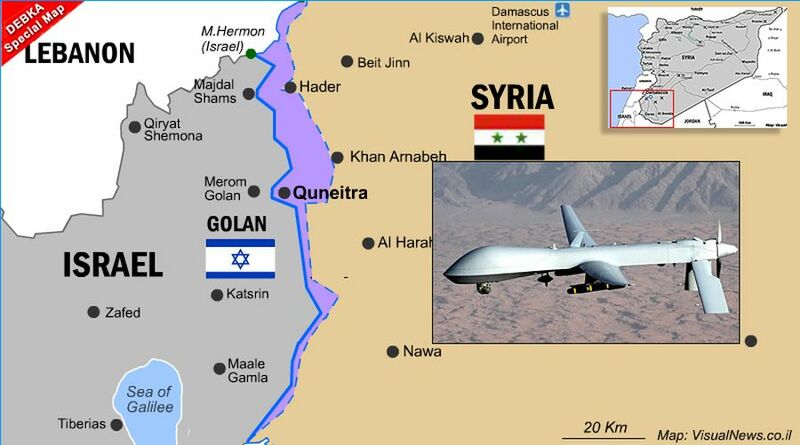 On July 13, Israel shot down a Syrian drone entering the buffer zone. This is no longer permissible. Israel is even precluded from discovering if the intruder belongs to Iran or Hizballah, leaving both these hostile entities free to fly at will over Israel’s Golan border. Furthermore, Assad may have those flight painted with Syrian air force markings, just as he supplies Syrian military uniforms to disguise Hizballah and pro-Iranian Shiite militiamen. Our sources reveal that it took the Assad regime no more than four days to renege on Syria’s role in the Helsinki accord. For regaining Quneitra, the Syrian army, led by disguised Hizballah and Shiite troops, was obliged to evacuate the Beit Jinn pocket opposite the IDF’s Hermon outpost. On Monday, July 16, the Syrians pretended to pull back, while actually leaving several hundred troops behind – disguised this time as civilians and farmers. One middle-eastern country that has fallen off the radar a bit is Iraq. And it certainly isn’t an oasis of peace at the moment. Looks like the people are revolting against the Iranian incursion. Najaf airport has been sacked. The border with Kuwait has been occupied by protesters and roads to major oil fields blocked in southern Iraq. The base of a Kata’ib Hezbollah pro-Iranian militia was set on fire. In response Baghdad has cut off access to Internet and social media apps, and sent elite counter-terrorism units, as well as the army, to quell the spreading protests. A year after the Iraqi security forces liberated Mosul from Islamic State, the country was supposed to be getting back on its feet. In February, Middle Eastern powers, including Saudi Arabia and Turkey, promised to help Iraq meet the $80 billion it wanted in reconstruction credit lines and aid. The US and western powers sought to support Baghdad as well. The US is plowing $250 million into Foreign Military Financing in Iraq, $850m. into “train and equip” funds, and $150m. toward stabilization and development programs. However, the funds have not trickled down to average people throughout Iraq. In May, voters in Iraq turned out for Muqtada al-Sadr’s Sairoon party, in a populist vote that helped the opposition Shi’ite cleric come in first. In second place was an alliance of Shi’ite militia-backed parties, many of them close to Iran. In third place was Iraq’s prime minister and his “victory” party which sought to capitalize on perceptions he had helped defeat Islamic State. Since the election, however, a government has not been formed and ISIS attacks have increased throughout many central provinces in Iraq. To tackle the ISIS threat, Baghdad sent half a dozen major military units fanning out into Salahuddin, Diyala, Kirkuk and Nineveh provinces on July 7, in an operation dubbed “Revenge of Martyrs.” Three days later, protesters in the southern city of Basra began assembling on roads leading to major oil fields. The police shot at the protesters, wounding and killing several. They set up tents; public strikes spread to the neighboring provinces of Dhi Qar, Wasit, Maysan and Babil. Reports spread online saying that dozens of security forces and protesters were killed in southern Iraq near the Iranian border at Amara. Oil workers were evacuated by helicopter. In the holy city of Najaf on July 13, protesters stormed the airport and locals claimed they ransacked planes belonging to Iran. Many Shi’ite pilgrims come from Iran to Iraq, and although many of the protesters were also Shi’ite, they were complaining that Iran’s influence in Iraq was overbearing. On Friday, protesters also targeted militia and party offices of Kata’ib Hezbollah in Najaf as well as of Dawa, Badr and Asa’ib Ahl al-Haq, all of which are closely connected to Iran and the Islamic Revolutionary Guard Corps. According to Iraq expert Haydar Al-Khoei, the protesters chanted “the Iranian Dawa party, the Safavids,” a reference to the Persian Empire and an attempt to portray modern day Iranian-backed parties in Iraq as a form of Iranian takeover of the country. There is boiling anger in Iraq at economic stagnation and blame is being cast on the parties that are connected to Iran. Like the protesters in Iran who have been angry at Tehran wasting money on foreign wars in Syria, Iraqis have accused their government of wasting time and resources on foreign connections while abandoning the people. For instance, the arrival of foreign mediators, including IRGC leader Qasem Soleimani from Iran as well as Hezbollah members from Lebanon – to discuss the new governing coalition – have been seen as foreign meddling. Baghdad has responded to the unrest by sacking police officials and dispatching the security forces, including the elite coalition trained Counter-Terrorism Service, to maintain order. Sending the elite units to deal with rioters is seen as Baghdad’s way of sending a non-partisan unit, rather than militia-aligned ones, to tackle with the problem. The CTS personnel are supposed to be perceived as neutrals and heroes of the war on ISIS. However, it is a heavy-handed tactic that could backfire. The CTS and other forces were in the middle of fighting ISIS north of Baghdad; redeploying them will take the pressure off the extremists. BAGHDAD ALSO sought to cut off the Internet and social media apps to stop the spread of the protests. This is the same tactic that Tehran has used against protests in Iran. Across Iraq there is outrage at the government actions. “Iraqi government asks the protesters to be reasonable after they have stripped them of the simplest rights: Electricity, water, Internet, job opportunities – and 60% of Iraq’s oil is being exported from the poorest cities in the country,” Ali Al-Baroodi, a photographer in Mosul, tweeted on Sunday. There is talk that the protesters will make a new “Arab Spring” in Iraq. Iraq is now in a state of emergency, with the government considering what will come next. Shifting forces from the north to the south and attempts to re-route electricity from Nineveh to Basra to placate demands are the few things left in Baghdad’s arsenal. Protesters have sacked government offices, and have succeeded in closing the border with Kuwait and shutting down air travel at an airport. Pro-Iranian media speaks of “infiltrators,” claiming the protests are being stoked from abroad, including social media in Kuwait. But powerful indigenous voices, such as Grand Ayatollah Ali al-Sistani have supported the demonstrators. Notably silent on the unrest are Western officials, with the US and UK embassies not tweeting since July 10. No expressions of concern for the cutting of Internet or shooting of protesters. Demonstrators may see that as quiet support for Baghdad’s heavy-handed tactics. Lacking support from the West and blaming Iran for their economic problems, Iraqis face another potential round of violence in a country that has seen decades of war and conflict. We do everything possible to prevent the escalation of the conflict” Russian Ambassador to Iran Levan Dzhagaryan. “Sometimes conflicts arise, and we are naturally concerned about the possibility of military confrontation between the Iranian and Israeli forces in Syria. We do everything possible to prevent it. To prevent the escalation of the conflict,” he was quoted as saying. Dzhagaryan told the paper that Iran is a “friendly country” and “one of our key partners” which cooperates with Russia in “various spheres” such as ending the war in Syria and that Iran’s presence in the war-torn country is legitimate because it was invited by the regime of Syrian President Bashar al-Assad. “Iran is not a country that you can put pressure on. This is a big state, pursuing an independent foreign policy. Work with Iranians can only be a method of persuasion,” Dzhagaryan said. Tensions between the two foes has risen in recent months and Jerusalem has repeatedly said it would not allow Iran to set up a permanent presence in Syria. In recent weeks Syrian government forces backed by Russian air-power have been retaking large swathes of territory on the Syrian Golan Heights from rebel groups along the Israeli border. Iranian forces and affiliated Shiite militias are also said to be playing a minor role in the offensive. Last week in a joint press conference in Helsinki with US President Donald Trump, Russian President Vladimir Putin agree on securing Israel’s border with Syria in accordance with the 1974 Separation of Forces Agreement following the Yom Kippur War. Moscow intervened in the Syrian conflict in September 2015 and as an ally of Syrian President Bashar al-Assad, Moscow finds itself part of an alliance between Damascus and Tehran, the patron of Hezbollah. Russia, which views Iran as a key player in resolving the crisis in Syria, has repeatedly emphasized the importance of the role that the Islamic Republic plays in the war-torn country. 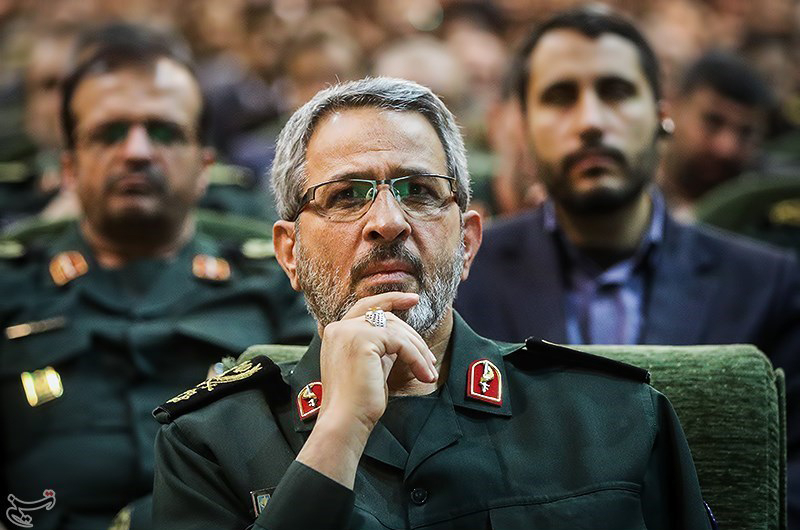 Israel believes that Iran’s Revolutionary Guard’s Corps and Quds forces have continued to entrench themselves in Syria despite strikes against Iranian targets attributed to Israel, the most recent being last week in Syria’s Aleppo province. Israeli intelligence estimates there are thousands of Iranian advisers and Iranian Revolutionary Guard Corps officers in Syria, some 9000 Shiite militia fighters from Afghanistan, Pakistan and Iraq and another 7,000 Hezbollah fighters.